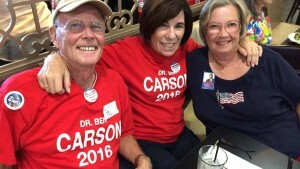 Carly Fiorina had a big fan at Wednesday night’s GOP debate watch party — Susan Lew, owner of the host Emerald Chinese Cuisine restaurant in Kearny Mesa. Pundits may have given the former Hewlett-Packard CEO the edge in the CNN debate, but a straw poll tallied midway through the 3-hour show saw front-runner Donald Trump win the night locally. 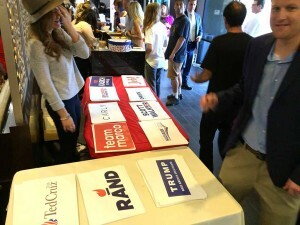 San Diego Republican GOP Chairman Tony Krvaric announced the top five finishers in the poll taken at the party-sponsored event: Trump, Ben Carson, Fiorina, Sen. Rand Paul and Sen. Ted Cruz. No percentage breakdown was given, but an overheard ballot-by-ballot tally indicated the vast majority of votes went to the top three. Who might prevail? he was asked. During the debate, shown on seven screens, the audience of 300 was fairly quiet and attentive. But the most excitement came when Fiorina challenged Trump. When Fiorina suggested arming the Kurds, yells and applause were heard. The real-estate billionaire drew laughter as well, especially when he suggested Paul provided plenty of material to mock the Kentucky senator’s looks.